Dimensions: 40" x 22" x 60"
Dimensions: 40" x 22" x 48"
Dimensions: 72" x 43" x 22"
Dimensions: 48" x 43" x 22"
Dimensions: 40" x 22" x 72"
Dimensions: 60" x 43" x 22"
Our Fullview displays can be purchased with special "finishes" like Whitewash, Distressing, and Custom Stains. 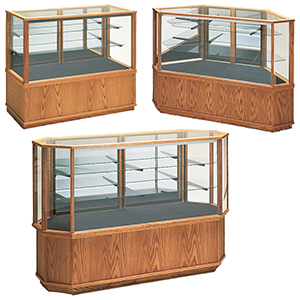 All prices are based on OAK displays with Minwax® Oil finish. We are happy to make these out of YOUR CHOICE of wood (Alder, Cherry, Maple, Walnut, etc. ), finish and/or design.